Lowerhouse could be without talismanic professional Ockert Erasmus for the remainder of the campaign after the South African ruptured his Achilles in a Twenty20 match. 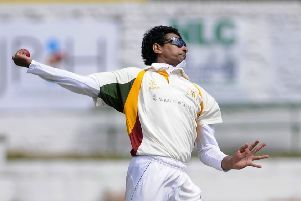 The 30-year-old all-rounder suffered the innocuous injury against Church at Liverpool Road on Friday, squirming in pain after catering for the wicket of Josh Scully. Erasmus, who has been highly influential for the West Enders this term, having posted 717 Lancashire League runs and adding 25 wickets, was transported to hospital where he underwent an x-ray to distinguish the extent of the trauma. “We had to carry him off and he went to hospital,” said skipper Ben Heap. “He’s had x-rays and he’s more than likely to be out for the season. “He’s really down at the minute which is understandable. He’s had a fantastic run of not missing a game for eight years, which he told me was around the 190-game mark. “It’s come at a bad time because the team has been doing well and he’s contributed massively. We’ve just got to try and carry it on. We will be looking for a sub-pro to cover. There are a few in the pipeline. “He’s got a great work ethic. He’s always striving to improve and help others. He’s been performing well this season and he did very well last season. The timing couldn’t be more cataclysmic with ‘House on the brink of a derby against rivals Burnley at Turf Moor and a Worsley Cup semi-final at home to Crompton on Sunday. Heap’s side are 16 points behind table toppers Walsden and they know they can’t afford to lose any more ground. The captain said: “We need to stay within striking distance. We are playing well as a team and we have different people stepping up to the mark and contributing and different times. “We’ve stuck together as a group and that’s got us on a roll. We are all feeling very confident and looking forward to the semi-final at the weekend as well. “We’ve been there before so it’s down to whether Crompton can handle the pressure of the situation. The atmosphere for a big game down at Lowerhouse is not one for the faint-hearted. Read have the chance to make Twenty20 Finals Day tonight but they’ll have to get past Brinscall at School Lane first. Brinscall topped their table in the group stages having won five of their six fixtures while Read picked up just four points from five outings. Ribblesdale Wanderers v Euxton, Salesbury v Whalley and Settle v Cherry Tree make up the remainder of the quarter-finals. Meanwhile, in the Ribblesdale Cricket League, at the time of writing, it was up in the air whether fixtures will go ahead with England due to face Sweden in their World Cup quarter-final tomorrow. Read were due to entertain Whalley, while Padiham were set to travel to New Lane to take on Oswaldtwistle Immanuel.